Grainger has recently been awarded The Women’s Choice Award for being a 2018 Best Company to Work for Millennials. They were one of a handful of distributors and manufacturers – other winners included 3M, Air Products & Chemicals, Avnet, General Electric and Honeywell International. These companies were recognized for time off, flexibility in work/life balance, professional development programs, education support and wellness benefits. As you look to grow your DigitalBranch team, how will you appeal to and find a good fit for your business? We spoke with Shawn Arnold, E-Commerce and Marketing Manager at Turner Supply Company, to get his insights and perspectives as a millennial working in Distribution. What first enticed you to work at Turner Supply? It was the perfect mix of being able to build an E-Commerce program from the ground up, working with a team that encourages innovation, and the ability to operate in an entrepreneurial way while having the stability and support of a well-established 100+-year-old family-owned company. What millennial-friendly opportunities does Turner Supply provide? As a company, we’re heavily focused on the next generation of talent. In an effort to ensure that our culture is a good fit for millennials, we’re focusing on areas that impact and benefit them the most, including company culture, health and wellness, and personal development opportunities. What do you like about the environment? From the people I get to work with, to the level of empowerment that Turner Supply provides, I have found the environment to be a great fit for me. The people here are not only experienced and smart – they are genuine and willing. They’re taking the time to teach me the business, mentor me in leadership, and challenge me to think and execute on a larger level. What could other distributors do to entice millennials? I recommend they focus less on the hype around the millennial workforce and more on the things that have worked for them in the past. 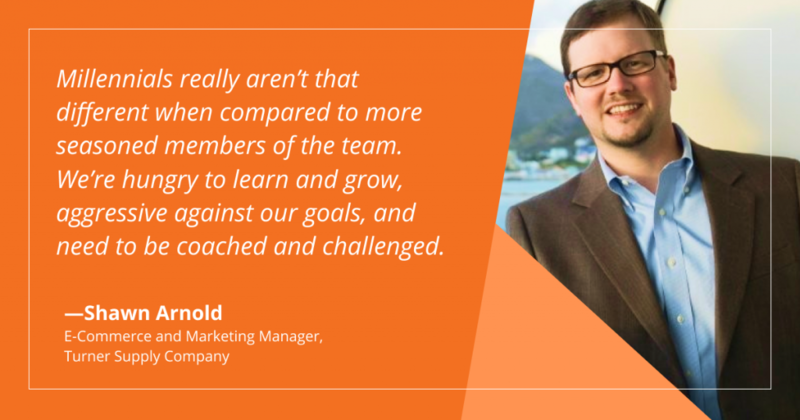 Millennials really aren’t that different when compared to more seasoned members of the team. We’re hungry to learn and grow, aggressive against our goals, and need to be coached and challenged. Turner Supply Company is one of the largest independently owned industrial distributors in North America. Turner is based in the Southeastern U.S. and has warehouses, distribution center locations, and integrated supply sites serving customers across the region, into Texas and beyond to international markets. Turner owns and operates its own fleet of delivery and service vehicles to offer regularly scheduled delivery service, in-plant vendor managed inventory programs, and non-scheduled emergency deliveries to meet its customers’ needs. It has a 24/7 customer emergency and delivery for its partners using its normal telephone system. Turner Supply Company is a member of Affiliated Distributors (AD), the largest buying and marketing group in the industry with over $25 billion in annual sales. Through interaction with other distributors in this association, as well as ISA (Industrial Supply Association), Turner Supply Company stays on the leading edge of new programs, technologies, and opportunities for its partners. Since 1905 Turner Supply has made the commitment in resources, personnel, technology, and foresight to meet the changing needs of its customers in the manufacturing and maintenance trades.